Over the years, countless games have allowed players to journey to the depths of hell. Tony Hawk’s Underground 2 lets you grind over a lake of fire. UmJammer Lammy sent you to hell by way of banana peel. The God of War series might as well be titled Hell and Back Again, A Half-God’s Holiday. But the versions of hell presented in these games weren’t created with eternal torment in mind. Some of them are meant to be creepy, or even horrifying, but above all else, they’re meant to entertain. As players explore the underworld, they’ll be thrilled, titillated, or even amused. That isn’t the case with The Lost Souls of Tong-Nou. 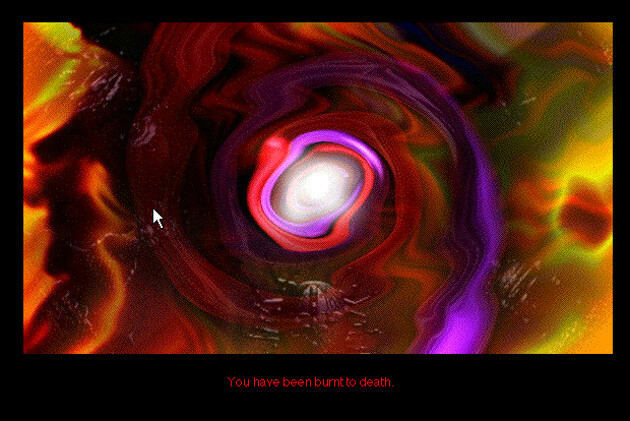 Created by Osamu Sato, who made the equally bizarre LSD: Dream Emulator, Tong-Nou tortures players at every turn. Its music is deliberately discordant; its puzzles are intentionally incomprehensible. It’s almost impossible to finish, even with the aid of walkthrough. The game is convoluted and frustrating in every conceivable way. And that’s exactly what Tong-Nou is trying to be. Like many games, Tong-Nou begins with a simple mission. 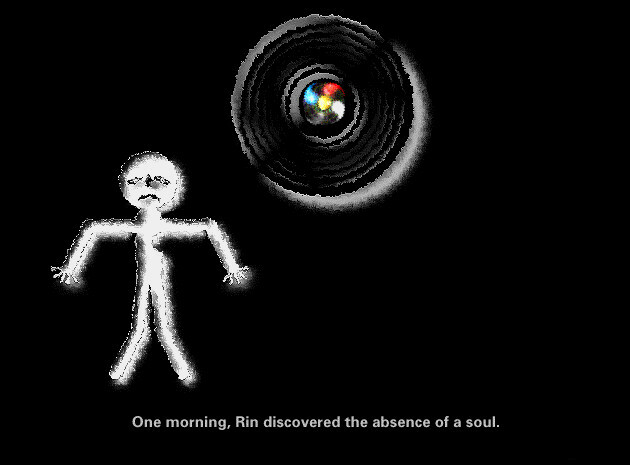 One morning, a man named Rin wakes up and realizes that he no longer has a soul. As he slept, his essence was devoured by the living island Tong-Nou. Since soulless individuals eventually die in emptiness, Rin sets out to get it back. His friend Yashiro gives him a temporary soul, which buys him 49 days. If he can get his soul back before then, Rin will be saved. But as soon as Rin arrives at the island, things get weird. 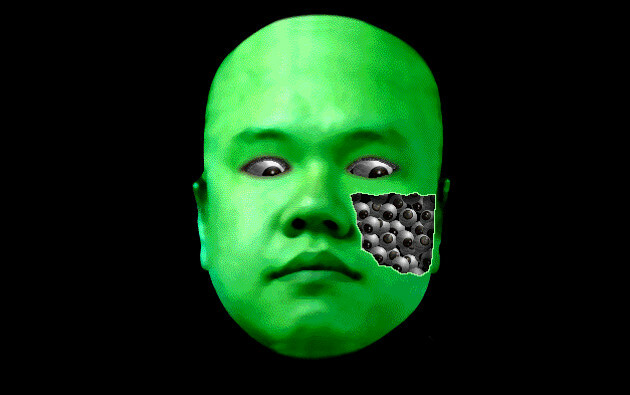 For starters, the “island” is a creepy green version of Osamu Sato’s head. Furthermore, the soul is impossible for Rin to find. When I say impossible, I don’t mean that the puzzles are really hard to solve. I mean that this is a task that Rin can literally not fulfill. No matter how many creatures he talks to or areas he explores, he won’t make any real progress. The only thing he can do is die. But death isn’t enough to release you from your torment. Upon dying, you’ll be asked to select a series of body parts, and you’ll be given a new life. From there, you’ll be given a new, equally incomprehensible quest that you’ll struggle to complete. Unless you die again. 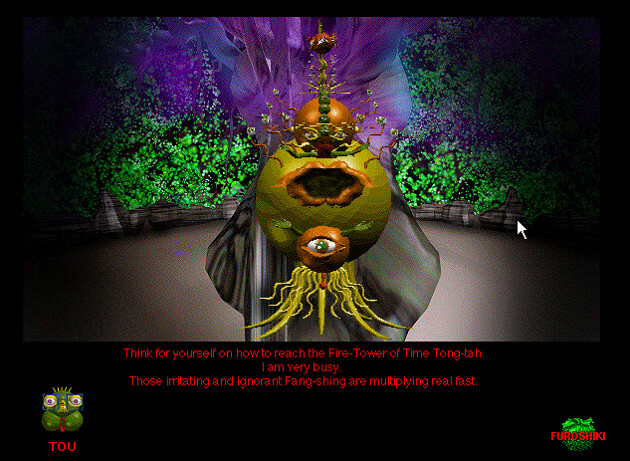 Unlike most games, which treat death as a fail state, Tong-Nou requires you to die to progress. In order to beat the game, you’ll have to go through nine lives, and it’s possible to die much more than that. In Tong-Nou death isn’t an obstacle to avoid, but a welcome respite. If you can’t stand a quest any longer, all you have to do is kill yourself, and you’ll take on someone else’s problems instead. 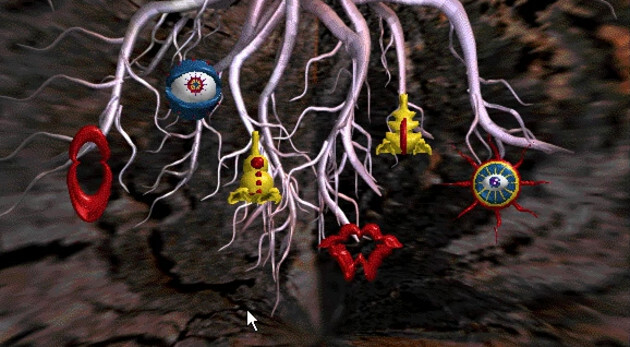 Tong-Nou was released in 1994, one year after the seminal title Myst. It was when adventure games were at their heyday; when developers were striving to create the most challenging puzzles possible. While most games tested your reflexes, adventure games forced you to rely on your intellect. Only a clever player could see a game through to the end. Of course, anyone who’s stumbled through a classic adventure title knows that that isn’t always the case. Hints are often needlessly obscure, and many puzzles have solutions that no player could reasonably guess. Even the most beloved titles, like Myst and King’s Quest, rely more on guesswork than wit. Tong-Nou takes that and exaggerates it to a surreal extreme. The game contains almost no hints — not even obscure ones — and it doesn’t have any sort of logical consistency. If you dare to ask someone for help, they’ll probably just tell you to go away. To make matters worse, the cacophonous, constantly changing music makes it impossible to concentrate. Playing Tong-Nou is a largely unpleasant experience, but that’s exactly what it was intended to be. Osamu Sato understands that a game doesn’t need to be fun in order to be engaging. A game can be a baffling experiment, a deconstruction of a much-loved genre, or a surreal trip through someone else’s dreams. As long as it’s interesting, people will play. I’m not sure if the island of Tong-Nou is supposed to represent hell, but it’s more hellish than any game I’ve ever played. There were times when I thought I couldn’t take it for another second, when I wanted to shut the game down and never start it up again. But in spite of that, I continued to wander through mazes, persisted in talking to unhelpful NPCs, and kept trying to solve unsolvable puzzles. No matter how much the game tormented me, I couldn’t look away. I was in agony, but I also thought it seemed strangely fitting. After all, it wouldn’t be hell if you could leave.